It isn’t often in the social media age that a driver can keep a secret under wraps, but that is exactly what Andrew DeMarco has done all season. White Girl Wasted as she is known as has been on the drag racing scene for a long time, and Andrew decided once again to change things up. During the last year and a half or so we have seen a great amount of backlash against the roots blower combo in X275, and other classes for that matter. In fact, Nick and Rich Bruder were the only ones that has successfully run this combo on the X275 playing field. That is all about to change for the 2019 season. You have read that right, Andrew, along with Dennis at DMC Racing & Darren Mayer of DMPE, have decided to redo the Mustang and place a roots blower in the engine bay. This is a big switch from the centrifugal blower that was previously in place early in 2018. We have known for the entire year that this was coming but promised Andrew to keep it under wraps until it was time. They are about to get to the point where testing of the new combo is going to commence, so before it slips out, Andrew wanted E3xtreme to put it out. Not only are Andrew, Dennis, and Darren involved, Andrew stated that Mike Faucher from Factory Billet Power is going to be tasked with helping tune the beast that he spec’d out and built. For you Ford fans out there, rest assure you will be happy to know that it’s still a small block Ford under the 8-71. Some specs for this is that Andrew will be running a 465 cid small block Ford. It features a billet block and SC1 heads from RFD. This will be a mechanical injected setup for the 8-71. The transmission putting the power to the rear of the vehicle is a Proformance 2-speed 400 transmission. It also features a Chance converter bolted up in the drivetrain. “It was time to change the game” Andrew said. He was well aware that John Sears had added about a car and a half of weight to the combo, but he thoughts are that even at that weight, his combo should be able to be competitive. “We have put the time in, and made sure that it is going to make competitive power” Andrew stated. The original plan was to test the car last week in Florida when his brother David was down there helping the owner that bought the old Buick test for next season, but there were some parts shipping issues that prevented that from happening. So now Andrew will have to test sometime after PRI. The plan is to run most of the larger radial races in the country, along with possibly running with either NMRA or NMCA. 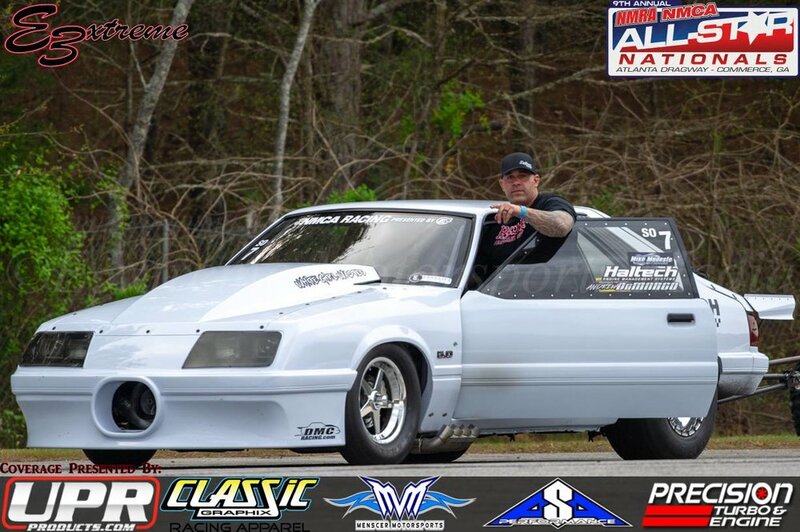 Series racing is something that Andrew has been involved with for a long period of time. “We could not be happier right now, knowing that we will be able to compete with the best of the best in 2019” said Andrew. I asked Andrew why he waited so long to release the info on this, and he stated that he wanted to make sure everything was good to go, and he was having too much fun watching people try to figure out what he was doing. Most people actually thought he was going to go with a nitrous combo, which was never actually an option. Social media assumptions always make for great entertainment though. Andrew wanted to give a shoutout to everyone involved with making this happen though. His brother David, right hand man and crew guy Jason Sabo, Lonnie Houde, Scott Filkins, Dennis MacPherson, Mike Fuacher, and Darren Mayer at DMPE. While the car is being wrapped up and ready for testing, right now we will share the photos Andrew was able to share with us. Once they hit the track we will make sure to get all of you some video and photos of White Girl Wasted. Until then, stay tuned to E3xtreme for all your news.